Here you will find answers to the most frequently asked fire safety questions from people in our community. The topics include smoke alarms, fire extinguishers, and general questions about the fire department. If you have a question that is not answered here, please send us a message using our contact form, and a member of the department will respond. Can a firefighter speak to our group or class? Yes! Please reach out to us using our Contact form, and include details about your scheduled event. Please contact us at least one month in advance of your event to allow for proper planning time. Can I visit the fire station? The public is always welcome to visit our fire station. Throughout the year, we have special “open house” activities scheduled. Remember, the firefighters at the station are on duty, and may need to respond to an emergency quickly. What events or activities does the fire department participate in? We have many special events and activities throughout the year. Please check out our News & Events page for dates and info. You can also follow us on Facebook, Twitter, and Instagram for the latest announcements. When I am driving and I see an emergency vehicle with lights and sirens on, what should I do? When you notice an approaching emergency vehicle, IMMEDIATELY pull to the right and stop. If you are approaching an intersection and see an emergency vehicle that is approaching the intersection from behind you or another direction, come to a stop preferably one or two car lengths back from the intersection. For more information on New York State’s “Move Over” law, please visit: http://www.thruway.ny.gov/travelers/safety/moveoverlaw.html. Being prepared for emergencies is one of the most important steps you can take to keep your family and property safe. Please see our Emergency Preparedness page for important information on steps you can take to make a plan. Press and hold the test button on your smoke alarm for a few seconds. If it is working correctly, the alarm will sound and will automatically stop when you release the button. Remember to test your smoke detector monthly, and change the batteries at least once a year. If your smoke detector is over 10 years old it needs to be replaced with a new unit. If you hear your smoke detector making a chirping sound, replace the battery as soon as possible. How many smoke alarms do I need in my home? One smoke alarm is not enough for the average home. You should have at least one smoke alarm in every bedroom, and in the hallway outside each bedroom. A typical 3-bedroom home would need at least 4 properly installed smoke alarms to provide a reasonable amount of protection for your family. A multi-purpose (ABC) fire extinguisher is best for the home. Look for the rating to be at least 2A-10B-C on the label. This extinguisher can be used on any type of fire commonly found in the home. We recommended installing an extinguisher in the kitchen and in the garage. How do I refill my fire extinguisher, or dispose of an old one? If your fire extinguisher has a gauge, then it can be filled. If there is no gauge, then the fire extinguisher is for one-time use only, and is disposable. 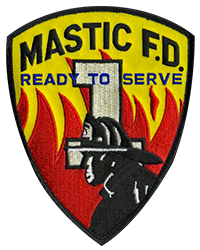 If you live in Nassau or Suffolk County, you can have your extinguishers filled and serviced at https://firematic.com/extinguishers.htm.